The Serena Williams comeback tour fell flat at the Mubadala Silicon Valley Classic Tuesday night. 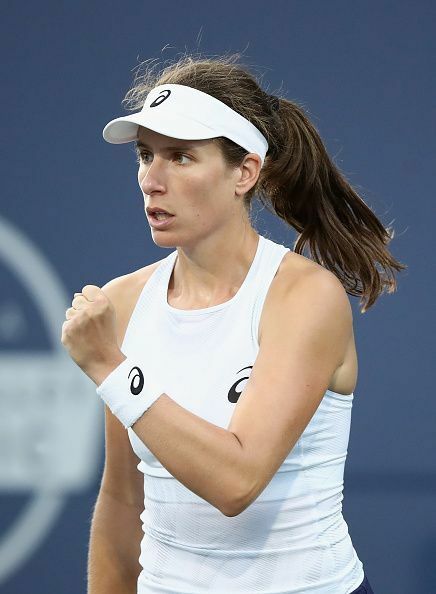 Her numerous double faults were too much to overcome as Johanna Konta took the victory 6-1, 6-0 on Stadium Court at the San Jose State Tennis Center. They met only once last year at the Australian Open where Williams held off the Brit and went on to win the season's first slam of the year. With both very well experienced, it would be to whoever would make their mark right away in the match. The American had shown a lot of fight making it all the way to the Wimbledon final. With that being her best way of getting back on track since becoming a mother, she would do everything to keep the momentum high and make a good start. Williams had moments of struggling to warm up with the forehand creating errors in her opening serve but landing enough winners to secure the hold. Konta did the same to level the score in the second before getting a break on William's three unforced errors. She handed the Brit another victory having troubles returning the ball putting too much on the forehand second serve. It was soon 4-1 for the 27-year-old as William's double-faulted for a third time that gave Konta enough calm to deal with what was shot at her. The Brit locked down the breakpoint with a lob that landed far from the former world number one's reach. With a 5-1 lead in hand, Konta went along for the ride as Williams was not yet up to speed dropping the set with the Brit scoring two set points to put the set to bed after 27 minutes. While her second serve didn’t produce much, Konta score 77 percent from the first serve and had her second serve return doing the brunt of attacks on Williams scoring points on 10 of 14. She continued dictating into the second set scoring two aces on serve before securing the serve to love. A second went to the Brit as her momentum remained firm with Williams struggling to put speed and accuracy in unison. It led to another break right before Konta took yet another hold of serve to sit three away from a major victory. Williams searched for a way to get into the set but despite her efforts to force deuce in the fourth, her unforced errors continued to rack up resulting in Konta going up 4-0. She served up an easy fifth victory that left Williams with little more than to try and survive in the match. A double fault came right off the bat of her forehand but got a save on Konta's long return. A second double fault gave Konta two match pints where she put the return into the net ending things in 51 quick minutes. "I really just tried to play the match on my terms and did what I can out there," Konta said to ESPN's Renee Stubbs. "I tried to play the player of the day and I felt that I played better than her on the day and it’s a humbling experience for me to on this stage. With the biggest win of the tournament under her belt, the 27 year old would look forward to Wednesday's second-round match against American Sofia Kenin.